One of David Robinson’s great gifts is the way he uses story to create learning. In his new book, The Seer, he helps us understand that “seeing” and “presence” are often interchangeable terms. As David says, “One must be present to see; one must see to be present.” The Seer is a book about seeing. Therefore, it is also a book about presence. What David writes about in this brilliant new book is the essence of Transformational Presence. I’m very excited to introduce this important new book to you. 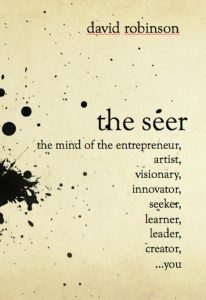 I turn this post over to David now to tell you a bit more about his work and share a couple of excerpts from The Seer. I’ve come to realize that the epicenter of my work as a coach and facilitator of organizational growth is to help people learn to see. The gift of the artist, the gift of the innovator, the gift of the leader, the gift of the team, emerges when they exit product-thinking and enter relationship-seeing. In this regard, organizations are no different than individuals. The Seer is a book about how to see. Learning to see is not a mystery. It does not take an evolved consciousness. It is not for the privileged few. Any child can do it. In fact, every child comes onto the planet capable of seeing. Presence is natural. Anyone who ‘s been part of a dynamic team can attest to it; seeing and presence are movements toward the whole. To see is to join. To see is to connect. Everyone can see as a child. And then something happens. Children learn to name things with words. Then they learn to spell the words they use to name things. Soon they grow up and have a hard time seeing beyond their words. Often they name their experiences before they even have them. They do not see what is there, they see what they think is there. It is a funny paradox about words – they can imprison your mind. Words can also set you free. It all depends upon how the words are used. Entrepreneurs and artists share this trait: in order to master their craft they must learn to see again. And, in order to see, they must once again understand the power of their words; they must learn to see beyond their story. They must learn to flip their assumptions and let go of what they think they know. The Seer is a story within a story. And, ironically, it articulates a process for how to see beyond the fog of personal story. It follows a man in the wake of a business collapse. He knows he needs to do things differently but hasn’t a clue about how to start. A friend connects him with a guide (dare I say “coach!”). He insisted that we work through online chat. No phone calls. No video. I thought it was odd but Virgil came highly recommended to me so I decided not to resist his preference. This was our first contact and I had just finished describing my business problems. Virgil: You don’t know what you don’t know. I stared at the screen and thought, That’s not very helpful. I had contacted him because I was tired of failing. I felt stuck. I felt like I was working all the time and somehow always ended back in the same place: at zero and broke. I had some great ideas for new products and services and yet I was once again at zero. My latest business collapsed just as the one before it. I was certain my latest venture was the one. I was certain. I brought my best game and still I failed. What was I doing wrong? His next message popped onto the screen. Virgil: You think, as everyone thinks, that you simply need to change what you are doing and that will solve all of your problems. You think there is a prescription. That kind of thinking will only lead you back to zero. I was getting frustrated. I was desperate. I needed to change. I needed to know what to do differently and I needed to know now. I needed to know! I’ve always known what to do but now I was lost. I was in no mood for mumbo-jumbo philosophy. Virgil: From what you wrote, I see that you think you have a problem. The first recognition is simple: you do not have a problem. You have a pattern. I closed my eyes and pinched the bridge of my nose. A pattern? That’s it? That’s the best this guy could offer me? Yes, I have a pattern. I have a pattern of failure and frustration. I knew that before I contacted him. And now I was so steeped in my pattern that I doubted everything I ever believed. I doubted myself. Virgil: I can help you change your pattern. I have no time to waste with you if you insist on having a problem. Problem thinking will return you to zero again and again and again. In fact, your insistence on having a problem is part of your pattern. If you are not ready or willing to change your pattern, it is better that we stop here. It is much better not to start until you are ready to challenge your assumptions and put down what you think you know of success and failure. Do you know the difference between a pattern and a problem? I didn’t know. And, frankly, I was having a hard time knowing why I should care. For a moment I thought about doing what I always do, pretending that I know the answer. I was taught that “not knowing” is a sign of weakness. “Not knowing” meant I was bad at my work. My mentor taught me that I was supposed to know what to do. It’s what made a good leader. It was the single-most important quality of a businessperson. Know what you are doing. But I was tired, scared and irritated so in defiance, as a challenge, I wrote the truth. Me: No. I don’t know the difference. Virgil: Good. That is honest, and your honesty is a great first step in establishing the new pattern. The old pattern says that you have to know the answer. It says that you have to know what you are doing before you act. It says you have to know where you are going before you take a step. Am I right? I smelled a trap so I tapped slowly. Me: What? I don’t understand! Growth is never in the direction of knowing. The same can be said of learning to see again. To practice “not knowing” is a first step to seeing patterns. Patterns reveal story. Story reveals choices. 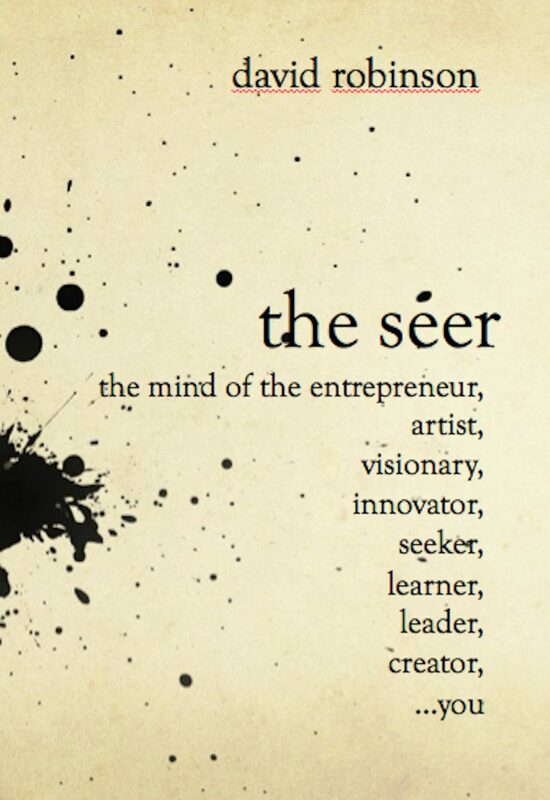 This is the learning path of The Seer. Recognize pattern and you will see your story. Recognize your story and you will see your choices. Recognize the power of your choices and you can change how you see. It begins with the practice “not knowing.” It leads to presence. Seeing is available when we cease to protect ourselves from what we don’t know and learn to step into the mysterious unknown land called opportunity. Seizing the day begins with seeing the day. The Seer can help you see. P.S. If you are inspired by David’s words above and are eager to learn to see in more expansive and creative ways, download David’s new book, The Seer.